 President George W. Bush established the President�s New Freedom Commission on Mental Health in April 2002 as part of his commitment to eliminate inequality for Americans with disabilities. The President directed the Commission to identify policies that could be implemented by Federal, State and local governments to maximize the utility of existing resources, improve coordination of treatments and services, and promote successful community integration for adults with a serious mental illness and children with a serious emotional disturbance. From June 2002 to April 2003, the 22 Commissioners met monthly to analyze the public and private mental health systems, visit innovative model programs across the country and hear testimony from the systems� many stakeholders, including dozens of consumers of mental health care, families, advocates, public and private providers and administrators and mental health researchers. The Commission received feedback, comments and suggestions from nearly 2,500 people from all 50 states via personal testimony, letters, emails and a comment section on this website. In addition to public comment, the Commission consulted with nationally recognized professionals with expertise in diverse areas of mental health policy. The Commission established 15 subcommittees to examine specific aspects of mental health services and offer recommendations for improvement. The Commissioner page contains the Commission�s Membership Roster and the Subcommittee page displays the separate subcommittees and their report summaries. The Commission will submit the final report to the President in May 2003, and the White House will, in turn, release the report soon thereafter. Once released, you will be able to access the final report on the "Reports" page of this website. The Commission wishes to thank all those who participated in this critical and historic effort. The final report to the President offers a vision of hope and recovery for people with a serious mental illness and their families.